Is There Intelligent Life in This Universe? Speaking from empirical scientific proof supported by data and experiment… I would have to say NO. I mean, seriously, the Roswell saucers crashed because of a little electromagnetic interference. And if you think about this planet… Donald Trump? Are you kidding me? These are Tellerons, not intelligent alien lifeforms. So there is simply no evidence that intelligent life exists anywhere in this universe. And you would be right. I am not claiming to be intelligent. I am not monkey-headed stupid either. And the government has been covering up the existence of visitors from other worlds since they took possession of the crashed space ship, or possibly two spaceships, from Roswell, New Mexico. The stupid part is that their efforts to cover it up and change the story are proof that it is true. Nobody goes to that much effort over that many years just for a bit of a goof-play. The reason the aliens were there looking around at an army air base is fairly obvious. What did the army air corps do in 1945 in Japan after all? The little gray guys were just worried about what their stupid neighbors were up to. Sooner or later, you know, stupid neighbors will mess all over your own back yard. So they came to investigate and stupidly got caught in a lightning storm, or possibly an Earther monkey-people weapon system. We are obviously dangerous enough for that. So speaking of empirical evidence, you have a chain of stupidity causing event after event, and all of it subverted by dishonest attempts to keep people from knowing the truth. Humans from this planet were stupid enough to use a couple of nuclear weapons to murder other humans. This is documented stupidity. If you believe the military and U.S. government, then you believe that they were using Project Mogul balloons to monitor Russian nuclear weapons development and crashed one of their super-secret balloons. Then the government officials misidentified their own balloon and okay-ed a newspaper report that the army had recovered a flying saucer. Immediately after being chewed out by a general, they then published a retraction newspaper story claiming the debris was a weather balloon, substituting pictures of crap from a real weather balloon that looked nothing at all like a flying saucer, and removing the top secret balloon crap so the Russians couldn’t learn that they were using balloons in the New Mexico desert. More documented stupidity. And if you don’t believe the military and U.S. government, then you are probably considering the eyewitness testimony of people who were there and saw things and heard things and were then threatened by military goons to be quiet or be disappeared into the New Mexico desert. Now, eyewitness testimony is not considered absolute proof because witnesses can be unreliable and even tell lies. But hundreds of people? Who corroborate numerous rumors and details? Even people like intelligence officer Major Jesse Marcel who would later reveal stunning details to UFO investigators? And you can’t guarantee silence from witnesses, even with threats, especially over time. But the fact that the government tried? Yep, documented stupidity. So, is there intelligent life in this universe? There is definitely life. But intelligent life? The evidence says “NO!” And remember, we elected Donald Trump to be our leader. Life is like a Three Stooges movie where I get to be Moe. Yes, you heard me right. I am the “smartest Stooge”. And although a lot of the wacky plans my family carries out are my plans originally, I get more than my share of eye-pokes and head-slaps. Financially I get more than my fair share of head-slaps. My income has now been frozen in retirement mode for the remainder of my life. I have to live three more years to get back all the money I paid into the pension plan for Texas teachers. It is a better pension than teachers can earn now, but it is set up with standards from over two decades ago. And, well, it is rather a difficult budget to manage when income is frozen and expenses are free to rise at will. I just paid $45 for groceries at Walmart and got four sacks of edibles. Seven cans of cheap-meal servings of chili and pork-n-beans (creating an alarming natural gas potential at our house), two cans of Pringles, 24 sodas in cans, two gallons of milk, Oscar Mayer salami, and some shampoo (hopefully we don’t have to eat the shampoo to avoid starving to death. I remember a time when a similar stash for the pantry cost a mere $10.) 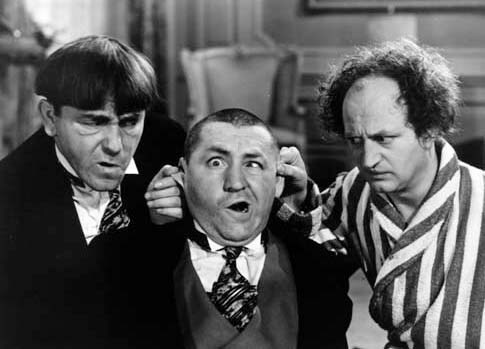 The point is, Walmart is treating us like Stooges, in the same way Mr. Dimsell treats his Stooges while working in Dimsell’s Drug Store in the movie, The Three Stooges Meet Hercules. So, the only answer is to accidentally send myself back to the days of Hercules with a homemade time machine invented in the basement under the drugstore. It will bring Dimsell to his knees and give him his just comeuppance. And it will thoroughly prove I can carry metaphors and analogies way too far. 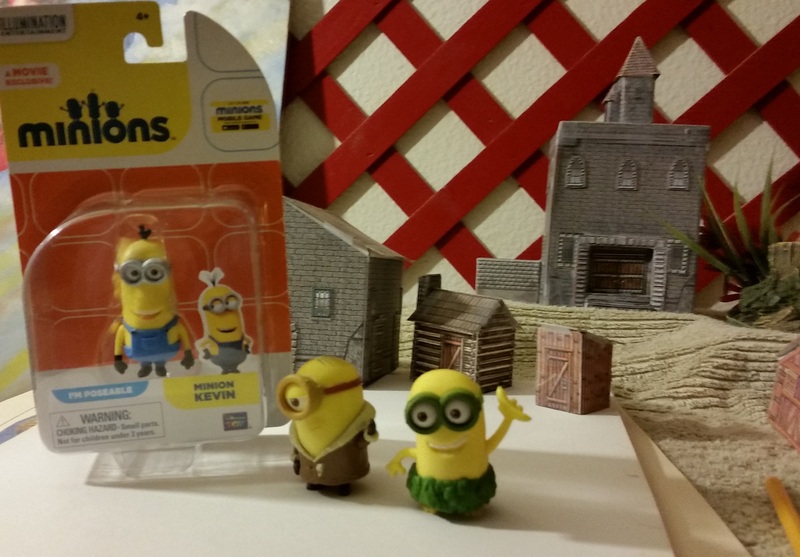 Minions are another form of Stooge… and I now have Kevin, Bob, and Stuart.